A total hip replacement is a surgical procedure in which both damaged surfaces of the hip joint are replaced with prosthetic substitutes. It was first performed in the 1960's and is said to be one of the most successful surgeries in the last few decades. It was called "The operation of the century" in an article published in the Lancet in 2007, as a result of the excellent outcomes achieved with this operation. According to the guideline for hip replacements at a tertiary centre in South Africa, 90-95% of hip replacements will still be functioning well after 10-15 years. 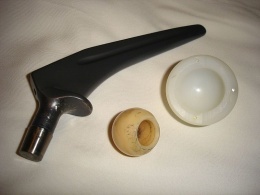 During a hip replacement, the head of the femur is replaced with a prosthetic head on a shaft, and the joint surface of the acetabulum is lined with a bowl shaped synthetic joint surface. A partial replacement can also be done for neck of femur fractures (mostly displaced) where only the femoral part is replaced. A lot of advances occurred in hip research over the last decade, but age, medical problems, hip disease, activity status and possible fracture characteristics should all be taken into account when considering hip replacement surgery. 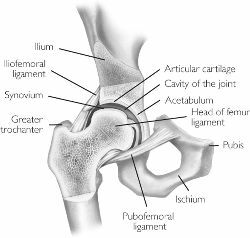 The hip is a ball and socket joint, meaning that the head of the femur fits into the acetabulum of the pelvis. The ball is the femoral head which fits into the socket, the acetabular part of the pelvis. This ball and socket design allows the poly-axial movement seen at the hip. The acetabulum is cup-shaped, providing the articular surface for the head of femur to move within. The head of the femur is gripped by the acetabulum beyond its maximum diameter. The head of the femur and the inside of the acetabulum are covered with a layer of hyaline cartilage. Once this cartilage is worn away or damaged (usually by arthritis), the underlying bone is exposed, resulting in pain, stiffness and possibly shortening of the affected leg. By replacing these surfaces the aim is to reduce pain and stiffness to restore an active and pain-free life. Total hip replacement is a frequently done procedure. Although mostly done electively, it is also used to in the management of hip fractures (mostly displaced neck of femur fractures) caused by trauma (e.g. fall) or pathological processes. Osteoporosis and osteomalacia are significant factors responsible for the high incidence of hip fractures within the elderly population. Arthritis is a common degenerative process occurring in joints within this elderly population, with osteoarthritis being the most common of the varieties. Due to the high degree of success at reinstating independence and mobility of osteoarthritis sufferers, total hip replacement procedures have become a well accepted treatment modality for hip degeneration secondary to osteoarthritis. It is also a treatment for juvenile rheumatoid arthritis but only if all the other options have failed. Neck of femur fractures: Often unable to walk, complains of vague pain in the knee, thigh, groin, back or buttock and difficulty of weight bearing . Impacted femur neck on X-ray. Osteoarthritis: Sensible or audible crepitations on movement, inability to assume the neutral anatomical position. Often also linked with painful and/or decreased range of motion. X-ray findings commonly include decreased joint space, subchondral sclerosis, cyst formation and osteophytes. Avascular necrosis: Similar signs as with osteoarthritis, often also with referred knee pain. Pain and loss of mobility are the most common preoperative complaints of patients prior to a total hip arthroplasty. In advanced cases, despite full conservative management, persistent pain, limited mobility and night pain is normally present. 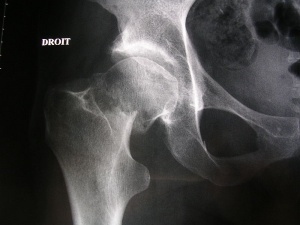 Preexisting hip disease is a valid indication for primary total hip replacement. When there are complications with the internal fixation of a fracture to the femoral neck, in particularly if articular cartilage in the acetabulum is lost or when endoprosthesis have failed in acute fractures, a total hip replacement is a good solution. 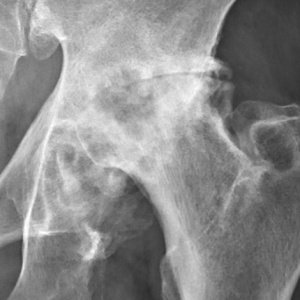 Fractures of the neck of the femur caused by an underlying pathology for example Paget’s disease in older patients are generally treated with a total hip replacement. When a patient is suffering from a rapidly destructive hip disease ,a rapid destruction of the femoral head or the pubic ramus is observed on the radiographs, therefore a total hip replacement should be the only option. Important considerations before choosing for a total hip arthroplasty are age, activity status, the patients expectations and medical conditions based on radiological disorders. In the end it’s the surgeon, together with the patient, decides if a total hip replacement is the best solution for the patient. Hip replacement prioritisation scores (e.g. New Zealand's National Clinical Priority System) can be used to determine the need or urgency of the hip replacement. This is often used in centers where patients are put on a waiting list for surgery due to limited resources, scoring patients on need and benefit of the surgery. 1. Active infection in the joint, unless carrying out a revision as either an immediate exchange or an interval procedure. 4. Malignant tumors that do not allow adequate fixation of the components. 1. Localized infection, especially bladder, skin, chest, or other local regions. 2. Absent or relative insufficiency of the abductor musculature. 4. Any process rapidly destroying bone. 5. Patients requiring extensive dental or urologic procedures, such as transurethral resection of the prostate, should have this performed before total joint replacement. Diagnosis of patients requiring total hip replacement surgery is mostly symptom based. Pain, loss of range of motion and functional impairments are mostly considered here. A comprehensive differential diagnosis should also be made for patients complaining of hip pain, as it can often be referred from the spine or pelvis and have no connection to the hip joint itself. An orthopaedic surgeon will guide the diagnosis and management process. There are specific ways to diagnose osteoarthritis, rheumatoid arthritis and hip fracture but for those subjects see the links above. This would be the first and, in a lot of cases, only radiological investigations requested, as a lot of the diagnoses in need of a hip replacement can be diagnosed or confirmed by this. This will guide the need for further investigations if needed. Many surgical approaches for THR are described but we can resume them to anterior, lateral and posterior approach. These approaches determine the amount of soft tissue damage and are used to determine the major precautions following total hip replacement surgery. Posterior approach surgery is the most preferred method of total hip replacement surgery. This method provides good visualisation of the femur and acetabulum and also spares the abductor muscle group. Anterior approach surgery is less invasive and damaging for muscles, capsules, ligaments and nerves. Other studies have shown a better rehabilitation time and functional outcome. Because of the lowered risk of dislocation compared to a posterior approach, early mobilizations as well as full weight bearing exercises according to tolerance are made possible in the first postoperative days. The use of minimally invasive surgery is becoming popular all around the world, due to the quicker recovery rates and reduced postoperative pain. Long term follow-up and comparison studies are still needed in this field. The articulating prostheses used by surgeons are made of metal-on-polyethylene (PE), ceramic-on-PE, metal-on-metal and ceramic-on-ceramic. Important components of prosthesis are friction-coefficient, survival, stability against dislocation and fixation in bone tissue. In some cases there can be formation of osteonecrosis due to erosion of the two components rubbing against each other. Recent studies have shown that Vitamin E infused polyethylene provides 95% less wear when compared to other liners. Melallosis. A complication that arises from metal corrosion and release of debris. This causes a massive local cytokine release with resulting inflammation. Systemically it can manifest in many ways. The only treatment is revision surgery. Patients are at risk of hip dislocation after replacement as a result of the trauma to the hip stabilizers of the hip (capsule, ligaments and muscles) as well as due to the size difference of the prosthesis to the bones. Reduced size of the prosthetic femur head when compared to the average human femur head makes it easier to dislocate until the stabilizing tissues have healed and adapted to this smaller size. This generally takes up to 6 weeks to heal. Hip replacements following this surgical approach is generally more stable. No specific ranges are currently linked to the precaution movements, as surgeon preference should also be taken into account. Prescribing preoperative exercise as soon as people are approved for hip surgery could play an important role towards improving preoperative quality of life, because people can wait many months for surgery and might experience further deterioration in health-related quality of life during long waits. Level 2b evidence shows that physiotherapy and educational therapy may be useful for end-stage osteoarthritis. A study on a 6 week education and exercise programme has shown significant and sustained improvements in pain and disability on patients wait-listed for joint replacement surgery. Further positive results included improvements in function, knowledge and psycho-social aspects. A pre-operative assessment and treatment session is very helpful in the planning of the post-operative management of patients following a total hip replacement. Benefits include decreased length of stay,decreased anxiety levels, improved self-confidence and establishing a relationship of trust between the physiotherapist and patient early on. Further benefits include improved quality of life and psychological health. It also helps to develop a patient-specific rehabilitation programme to follow post-operative, taking assessment findings into consideration. The main factors defining the therapy management are the surgical approach and the general state of the patient. Whether the patient desires to gain physical fitness or wishes to recover for recreational activity should also be taken into account when establishing the rehabilitation programme. Research has shown that a combination of verbal explanation and written pamphlets is the best method for health education. It is very important to incorporate this into the pre-operative physiotherapy management of patients prior to total hip replacements. Pre-operative education on precautions are liked to better post-operative adherence. The aim of post-operative rehabilitation is to address the functional needs of the patient (e.g. start mobilising) and to improve strength and range of motion. This starts off as an assisted process, but the aim is to get the patient as functional as possible prior to discharge. As a result of the underlying pre-operative pathology, patients may present with muscle atrophy and loss of strength, particularly in the gluteus medius and quadriceps muscles. The result of the loss of strength is that the elderly are less independent. Although the surgery will correct the joint problems, any associated muscle weakness that was present before the surgery, will remain and require post-operative rehabilitation. Research has shown hip abductor weakness after surgery is a major risk associated with joint instability and prosthetic loosening. Early postoperative rehabilitation after a total hip replacement focuses on resorting mobility, strength, flexibility and reducing pain. It is found that patients can achieve significant improvements through a targeted strengthening programme following total hip replacement. No specific general hip replacement protocol is currently in use, as small elements of the rehabilitation process is surgeon specific. For example, in some enhanced recovery after surgery protocols, patients are mobilised out of bed within the first 6 hours post surgery. Other settings may only start mobilising patients out of bed on day 1 or 2 post surgery. Accelerated rehabilitation programmes and early mobilisation have shown to give patients more confidence in their post-operative mobilization and activities of daily living, as well as being more comfortable with earlier discharge. Physiotherapy maximizes the patient’s function which is associated with a greater probability of earlier discharge, which is in turn associated with a lower total cost of care(level of evidence 2c). Physiotherapy provides pain relief, promotes rehabilitation and the reintegration of patients into ADLs. It also provides a better quality of life through the patients’ reintegration into social life  (level of evidence 1b). Level 1b evidence suggests that bed exercise following a total hip replacement does not seem to have an effect on the quality of life, but stays important for the effects on oedema, cardiac function and improving range of motion and muscle strength (level 4 evidence).. It also allows an assessment of the physical and psychological condition of the patient right after surgery. Early weight bearing and physical activity has benefits for the quality of bone tissue as it improves the fixation of the prosthesis and decreases the incidence of early loosening. The amount of activity is patient specific, and clinical reasoning should be used to make adaptions where needed. Certain specific sport movements have a higher risk of injury for unskilled individuals, and should be incorporated later in the rehabilitation process under supervision of a physiotherapist or biokinetisist. The following is a suggested protocol in the absence of complications. Surgeon preference should be taken into account, as well as any other factors that might hinder the following of the protocol. Adaptions should be made to make it more patient specific. Revision of precautions and contraindications (provided that patient had a pre-operative session with the physiotherapist, otherwise full education will be done as mentioned in pre-operative section). Combination of day 2 & 3 to discharge patient day 2 post surgery. Proper preoperative examination and early postoperative rehabilitation is crucial for successful outcome. Pre-operative patient workbook on "living with osteoarthritis"
↑ Levine BR, Klein GR, Cesare PE. Surgical approaches in total hip arthroplasty: A review of the mini-incision and MIS literature. Bulletin of the NYU Hospital for Joint Diseases 2007;65(1):5-18. ↑ Learnmouth ID, Young C, Rorabeck C. The operation of the century: total hip replacement. Lancet 2007; 370: 1508–19. ↑ 3.0 3.1 University of Stellenbosch, Advanced orthopaedic training center. Orthopaedic referral guidelines, Tygerberg Hospital 2013 - Arthroplasty unit. http://www0.sun.ac.za/aotc/referrals/guidelines/Arthroplasty.pdf (accessed 26/06/2018). ↑ Iglesias SL, Gentile L, Mangupli MM, Pioli I, Nomides RE, Allende BL. Femoral neck fractures in the elderly: from risk factors to pronostic features for survival. Journal of Trauma and Critical Care. 2017;1(1). ↑ 6.0 6.1 Trudelle-Jackson E, Smith SS. Effects of a late-phase exercise program after total hip arthroplasty: a randomized controlled trial. Archives of physical medicine and rehabilitation 2004;85(7):1056-62. ↑ 8.0 8.1 8.2 Gremeaux V, Renault J, Pardon L, Deley G, Lepers R, Casillas JM. Low-frequency electric muscle stimulation combined with physical therapy after total hip arthroplasty for hip osteoarthritis in elderly patients: a randomized controlled trial. Archives of physical medicine and rehabilitation 2008;89(12):2265-73. ↑ 9.0 9.1 9.2 Jan MH, Hung JY, Lin JC, Wang SF, Liu TK, Tang PF. Effects of a home program on strength, walking speed, and function after total hip replacement. Archives of physical medicine and rehabilitation 2004 ;85(12):1943-51. ↑ 10.0 10.1 10.2 Stockton KA, Mengersen KA. Effect of multiple physiotherapy sessions on functional outcomes in the initial postoperative period after primary total hip replacement: a randomized controlled trial. Archives of physical medicine and rehabilitation 2009;90(10):1652-7. ↑ 11.0 11.1 Rahmann AE, Brauer SG, Nitz JC. A specific inpatient aquatic physiotherapy program improves strength after total hip or knee replacement surgery: a randomized controlled trial. Archives of physical medicine and rehabilitation 2009;90(5):745-55. ↑ Batra S, Batra M, McMurtrie A, Sinha AK. Rapidly destructive osteoarthritis of the hip joint: a case series. Journal of orthopaedic surgery and research 2008;3(1):3. ↑ 15.0 15.1 15.2 Walters J, editor. Orthopaedics - A guide for practitioners. 4th Edition. Cape Town: University of Cape Town, 2010. ↑ 16.0 16.1 Brunner LC, Eshilian-Oates L, Kuo TY. Hip fractures in adults. American family physician 2003;67(3):537-42. ↑ Affatato S. Perspectives in total hip arthroplasty: Advances in biomaterials and their tribological interactions. London: Woodhead Publishing, 2014. ↑ Brotzman B. Clinical Orthopedic Rehabilitation (2003)-S. Brotzman, KE Wilk. 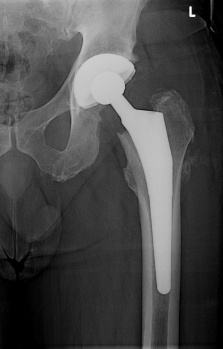 ↑ Kelmanovich D, Parks ML, Sinha R, MD, Macaulay W. Surgical Approaches to total hip arthroplasty. Journal of the Southern Orthopaedic Association 2003;12:90-94. ↑ Chechik O, Khashan M, Lador R, Salai M, Amar E. Surgical approach and prosthesis fixation in hip arthroplasty world wide. Arch Orthop Trauma Surg. 2013;133(11):1595-600. ↑ Hoppenfeld S, DeBoer P, Buckley R. Surgical exposures in orthopaedics: the anatomic approach. Philidelphia, PA: Lippincott Williams and Wilkins, 2009. ↑ Zhang XL, Shen H, Qin XL, Wang Q. Anterolateral muscle sparing approach total hip arthroplasty: an anatomic and clinical study. Chinese medical journal. 2008 Aug;121(15):1358-63. ↑ 26.0 26.1 Röttinger H. Minimally invasive anterolateral surgical approach for total hip arthroplasty: early clinical results. Hip International 2006;16(4):42-7. ↑ Sköldenberg O, Ekman A, Salemyr M, Bodén H. Reduced dislocation rate after hip arthroplasty for femoral neck fractures when changing from posterolateral to anterolateral approach: a prospective study of 372 hips. Acta orthopaedica 2010;81(5):583-7. ↑ Alecci V, Valente M, Crucil M, Minerva M, Pellegrino C, Sabbadini DD. Comparison of primary total hip replacements performed with a direct anterior approach versus the standard lateral approach: perioperative findings. J Orthopaed Traumatol 2011;12:123-129. ↑ Verywell Health. Orthopedics - hip and knee - replacement implants.http://orthopedics.about.com/od/hipkneereplacement/a/implants.htm (accessed 23/07/2018). ↑ Bader R, Steinhauser E, Zimmermann S, Mittelmeier W, Scholz R, Busch R. Differences between the wear couples metal-on-polyethylene and ceramic-on-ceramic in the stability against dislocation of total hip replacement. Journal of materials science: materials in medicine 2004;15(6):711-8. ↑ Garcia-Rey E, Cruz-Pardos A, Garcia-Cimbrelo E. Alumina-on-alumina total hip arthroplasty in young patients: diagnosis is more important than age. Clinical Orthopaedics and Related Research 2009;467(9):2281-9. ↑ 32.0 32.1 Mahendra G, Pandit H, Kliskey K, Murray D, Gill HS, Athanasou N. Necrotic and inflammatory changes in metal-on-metal resurfacing hip arthroplasties: relation to implant failure and pseudotumor formation. Acta orthopaedica 2009;80(6):653-9. ↑ Zimmer Biomet. The E1™ Antioxidant Infused Technology Process. http://www.biomet.fi/viewversion.cfm?contentversionid=36999&sc=1 (accessed 2506/2018). ↑ 35.0 35.1 Dargel J, Oppermann J, Brüggemann G, Eysel P. Dislocation Following Total Hip Replacement. Dtsch Arztebl Int 2014;111:51-52. ↑ 36.0 36.1 Petis S, Howard JL, Lanting BL, Vasarhelyi EM. Surgical approach in primary total hip arthroplasty: anatomy, technique and clinical outcomes. Can J Surg 2015;58(2):128–139. ↑ American Association of Orthopaedic Surgeons. Total hip replacement. https://orthoinfo.aaos.org/en/treatment/total-hip-replacement/ (accessed 25/06/2018). ↑ Partridge T, Jameson S, Baker P, MBBS, Deehan D, Mason M, Reed MR. Ten-Year Trends in Medical Complications Following 540,623 Primary Total Hip Replacements from a National Database. J Bone Joint Surg Am 2018;100(5):360–367. ↑ Gill SD, McBurney H. Does Exercise Reduce Pain and Improve Physical Function Before Hip or Knee Replacement Surgery? A Systematic Review and Meta-Analysis of Randomized Controlled Trials. Archives of physical medicine and rehabilitation. 2013;94(1):164-76. ↑ Ferrara PE, Rabini AL, Maggi LO, Piazzini DB, Logroscino G, Magliocchetti G, Amabile E, Tancredi G, Aulisa AG, Padua L, Gnocchi DC. Effect of pre-operative physiotherapy in patients with end-stage osteoarthritis undergoing hip arthroplasty. Clinical rehabilitation 2008;22(10-11):977-86. ↑ Crowe J,Henderson J. Pre-arthroplasty rehabilitation is effective in reducing length of hospital stay. Canadian Journal of Occupational Therapy 2003;70:88-96. ↑ 45.0 45.1 45.2 45.3 Barnes RY, Bodenstein, K, Human N. Raubenheimer J, Dawkins J, Seesink C, Jacobs J, van der Linde J, Venter R. Preoperative education in hip and knee arthroplasty patients in Bloemfontein. South African Journal of Physiotherapy 2018;74(1). ↑ Galea MP, Levinger P, Lythgo N, Cimoli C, Weller R, Tully E, McMeeken J, Westh R. A targeted home-and center-based exercise program for people after total hip replacement: a randomized clinical trial. Archives of physical medicine and rehabilitation 2008;89(8):1442-7. ↑ Robertson NB, Warganich T, Ghazarossian J, Khatod M. Implementation of an accelerated rehabilitation protocol for total joint arthroplasty in the managed care setting: the experience of one institution. Advances in Orthopedic Surgery. 2015;387197. ↑ Coulter CL, Scarvell JM, Neeman TM, Smith PN. Physiotherapist-directed rehabilitation exercises in the outpatient or home setting improve strength, gait speed and cadence after elective total hip replacement: a systematic review. Journal of physiotherapy. 2013;59(4):219-26. ↑ Freburger J. An analysis of the relationship between the utilization of physical therapy services and outcomes of care for patients after total hip arthroplasty. Physical therapy 2000;80(5):448-458. ↑ Umpierres CS, Ribeiro TA, Marchisio ÂE, Galvão L, Borges ÍN, Macedo CA, Galia CR. Rehabilitation following total hip arthroplasty evaluation over short follow-up time: Randomized clinical trial. Journal of rehabilitation research and development. 2014;51(10):1567-78. ↑ Smith TO, Mann CJ, Clark A, Donell ST. Bed exercises following total hip replacement: a randomised controlled trial. Physiotherapy 2008;94(4):286-91. ↑ Perhonen MA, Franco F, Lane LD, Buckey JC, Blomqvist CG, Zerwekh JE, Peshock RM, Weatherall PT, Levine BD. Cardiac atrophy after bed rest and spaceflight. Journal of applied physiology 2001;91(2):645-53. ↑ Suetta C, Aagaard P, Rosted A, Jakobsen AK, Duus B, Kjaer M, Magnusson SP. Training-induced changes in muscle CSA, muscle strength, EMG, and rate of force development in elderly subjects after long-term unilateral disuse. Journal of Applied Physiology 2004;97(5):1954-61.